JE SUIS BENI is a brand new Four Winns V275 express cruiser that was delivered to her owner in the spring of 2017 and has only had 22 hours put on her upgraded Volvo Penta 300hp engine. 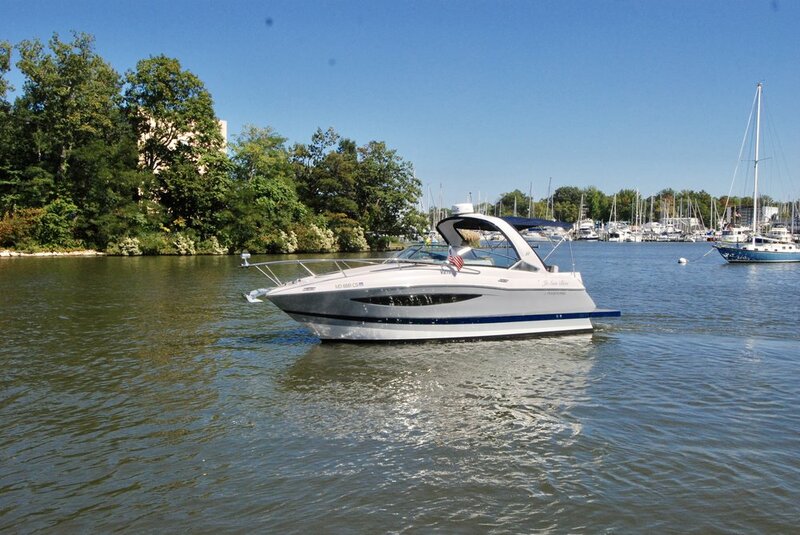 This boat looks new in every way and was delivered with an extensive amount of manufacturer upgrade packages including a Garmin chart plotter with radar display (very uncommon bonus feature in this size yacht), reverse-cycle marine air conditioning, and a full canvas enclosure. 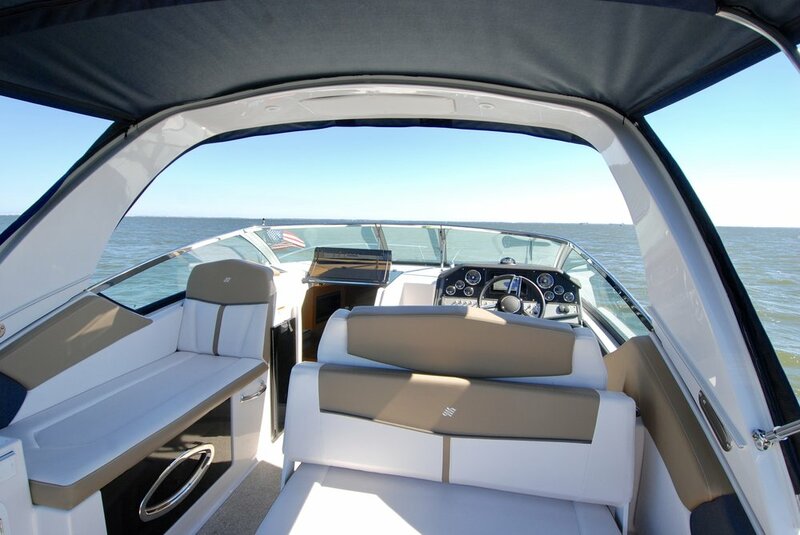 This yacht is set up for entertaining with adjustable cockpit seating for any seating arrangement, an upgrades stereo system, LED colored cockpit lighting, and a number of other awesome upgrades. This like-new yacht shows as if she was just delivered yesterday. Her former-military owner has kept all of the systems and features in bristol condition this season which really help JE SUIS BENI shine. 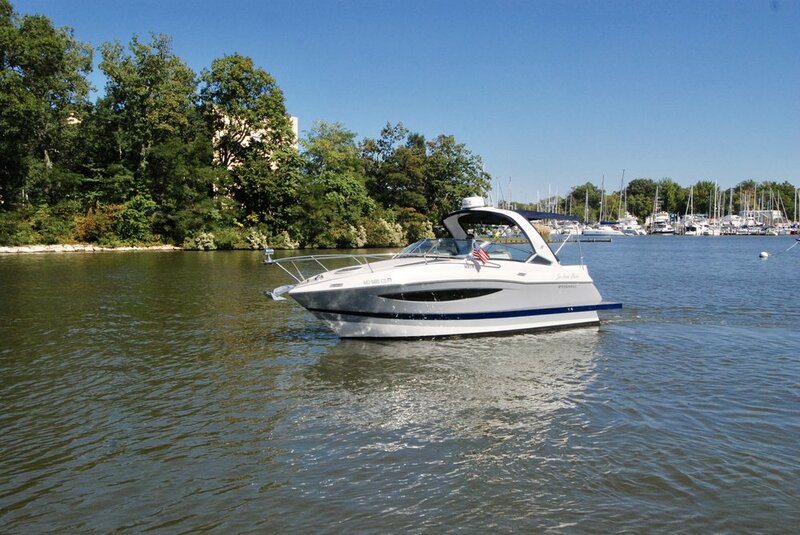 A new model of this yacht with all of the added upgrades retails today for $130,000. JE SUIS BENI offers the features and condition of a brand new yacht without the brand new price! Step aboard the large aft swim platform and enter the spacious cockpit that comfortably seats seven people. With a double helm seat that offers comfortable seating at the helm or folds up for added support when standing under way. 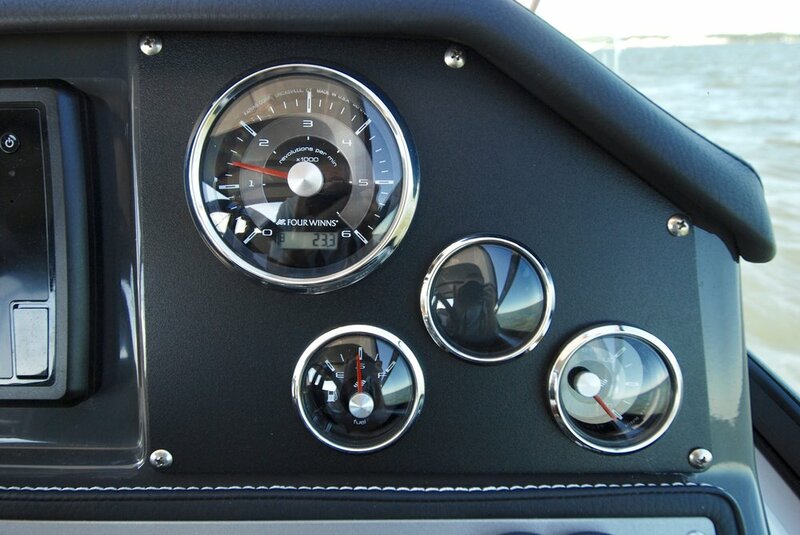 Behind the helm seat is an adjustable double seat facing aft. 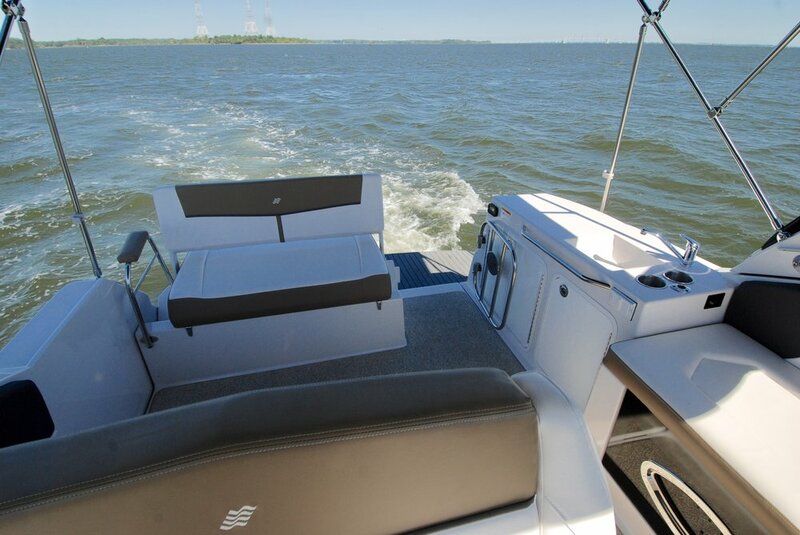 The seat back pivots down and back to create a large sun pad area with the third adjustable double seat along the stern. 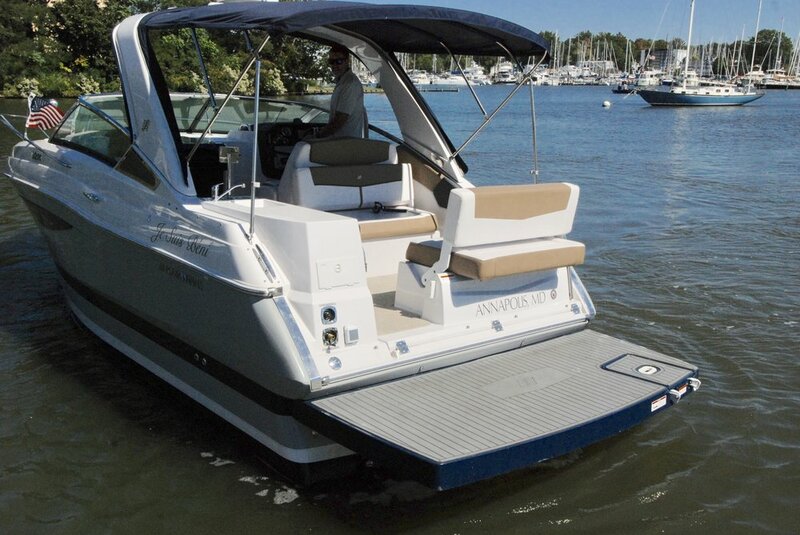 The stern seat can be adjusted to lie flat as well and face forward or aft for complete seating versatility. A chase style lounge to port provides comfortable lounge space even under way. A wet bar area with a fresh water sink, tons of counterspace and large storage cabinets lies to port. A removable cockpit table offers additional table space and cup holders. The fiberglass arch helps integrate the full canvas enclosure with eisenglass windows. 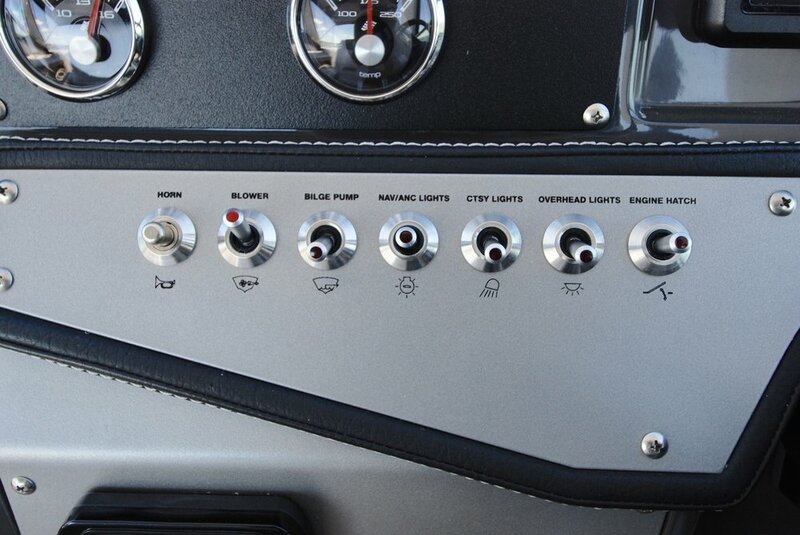 Color adjustable cockpit lights offer a fun evening atmosphere aboard even after the sun goes down. The main salon offers a relaxing space to head down to after a fun day of boating. With large fixed side ports, two overhead skylights and a large overhead opening Bomar hatch, there is a ton of natural light and ventilation down below. Crank up the reverse-cycle heat and air conditioning for your perfect temperature and relax on the large v-shaped salon seating. A removable salon table comfortably dines 3-4 people or it can be removed to allow for a filler cushion that creates a large double bed for additional sleeping space. The upgraded wood trim interior with light color palate looks brand new and really brightens up the interior. 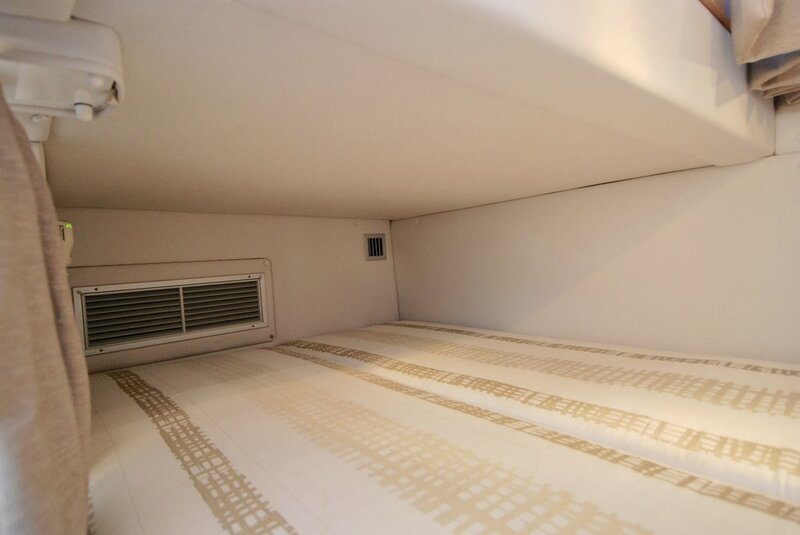 Just inside the companionway hatch, the galley is perfectly located for easy access from the cockpit. 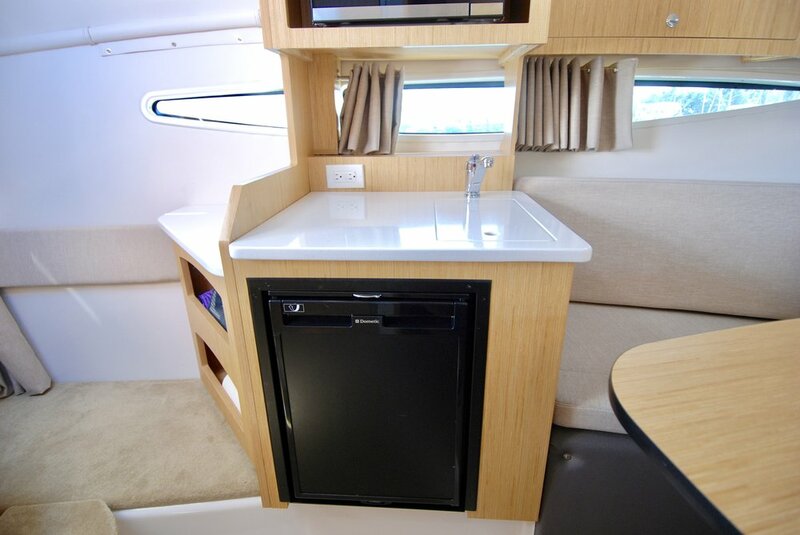 With nice counter space, a convection microwave and a below-counter fridge, the galley is ready for entertaining. The integrated sink has a lid that helps create additional counter space as well as a shelf just aft of the main galley area with an ivory corian counter top as well. A large double berth located aft of the companionway can be separated from the main salon with privacy curtains and offers a great space to curl up during your weekend cruise. The aft cabin has reverse-cycle marine air conditioning and heat, accent reading lights, an opening side hatch into the cockpit space and easy access to the main cabin. 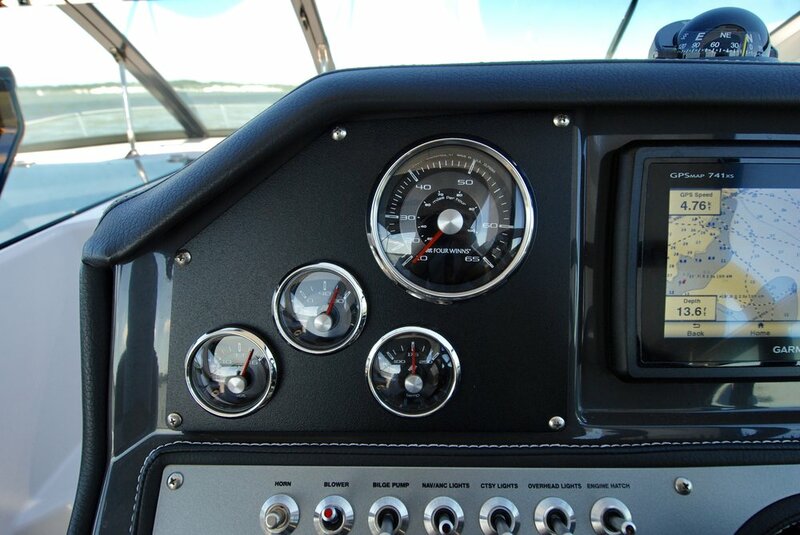 The Four Winns 275 has a spacious head conveniently located just inside the companionway hatch. The upgraded electric head, integrated shower, corian countertops, ample storage and vanity mirrors add to the function of the space. This Four Winns 275 was delivered to her owner in the spring of 2017. 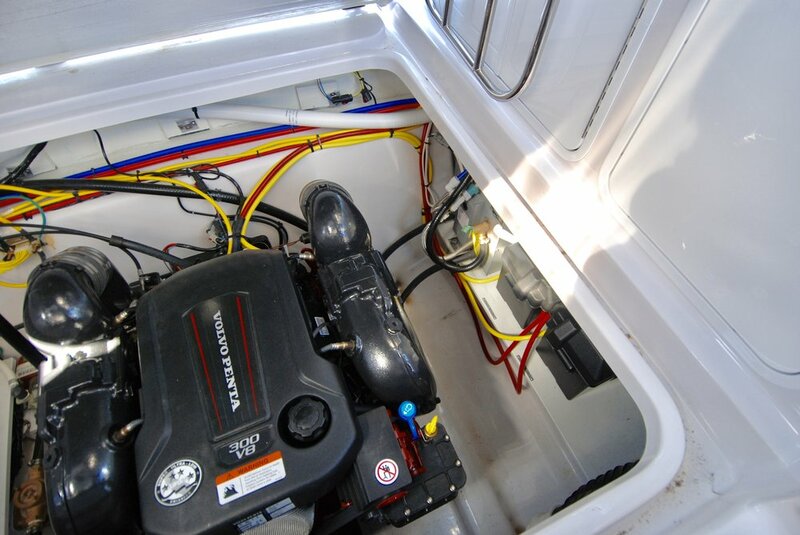 She only has 22 hours on her upgraded Volvo Penta V-8 300-horsepower gas engine. The engine room is very clean. The dual prop Volvo Penta outdrive helps Je Suis Beni quickly get on plain. The outdrive can be raised and lowered for navigating shallow water or ramps. 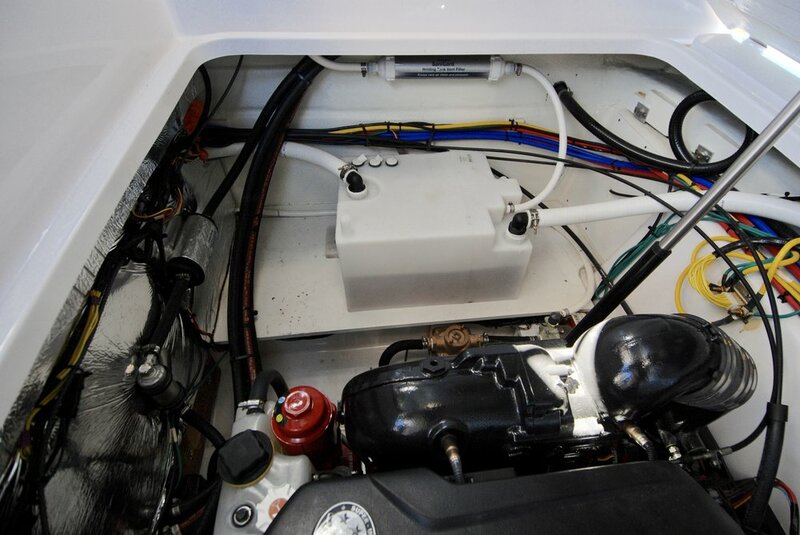 After taking delivery of her brand new Four Winns V275, the owner has unfortunately had some scheduling hassles and does not have time for the boat like she had hoped to (hence only 22 hours on the engine in an entire summer season). She loves the boat! But she doesn't want it to sit unused.